This is how it looked like when we were winding down from Lake Tahoe. Thankfully, we got down safely. This was the highlight of our day trip-a view of Lake Tahoe. 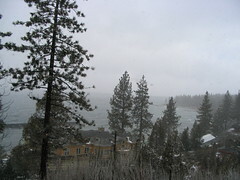 The weather forecast for Tahoe was really bad that day. 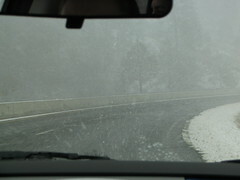 We started out planning not to go there since it’s up on the mountain and driving in the snow/ice would be dangerous. But then it’s Lake Tahoe after all-the tallest alpine lake in the US, and we were so very close and it would have been a great disappointment if we did not see the Lake. So we took the risk and drove up and up, and the weather looked OK. Moments after I took this picture it started to snow. And down and down the mountain we go. It would have been really great if it was a clear and sunny day but at least we got to see Lake Tahoe. This is probably the only picture of the group. 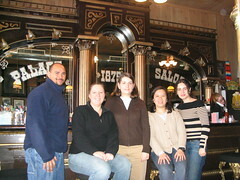 We had lunch at the Palace Saloon restaurant in Virginia City. Virginia City is one of those wild wild west towns and the Palace Saloon is one of those saloons where people would come for drinks..sort of reminds me of saloons in old western shows. On Saturday, the five of us rented a PT Cruiser and had a mini tour of Virginia City, Carson City and Lake Tahoe. 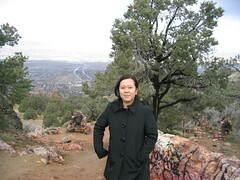 Here I am at a lookout point on the way up to Virginia City. It was really windy and cold when this picture was taken. About 5 minutes later rain and hale started to fall. 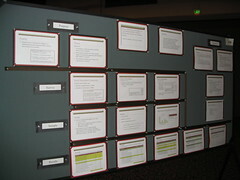 My nicely laid-out poster presentation. My biased colleagues unanimously voted this the best looking poster of the conference. I went around looking at the other posters and I have to agree with them. Unfortunately the poster session is at 6.30pm to 8pm and by that time everyone is tired and won’t really bother reading the details of the poster. I don’t blame them. I was just waiting for 8pm to come and then off to free mexican dinner with my colleagues, courtesy of my advisor. 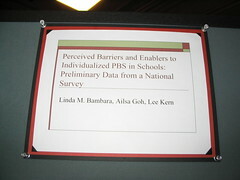 This is the title frame of my poster presentation at the Third International Positive Behavior Supports(PBS) conference in Reno. The survey work earned me a free trip to Reno. Hopefully further data analysis will lead to free trips to other places/conferences next year. 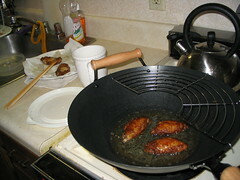 This is not the first time I’m using the new tai-wok but it is the first time I’m using the wire-rack for frying stuff on the wok. Why belacan chicken? I have this belacan chicken flour-mix that expired last December, so I have to use them up and not waste them. 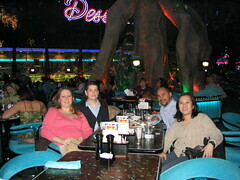 I was at the Penang restaurant in Philadelphia last Saturday with 3 friends. We had roti canai, chicken satay, nasi lemak, prawn mee, char koay teow and curry mee with yong tow fu. 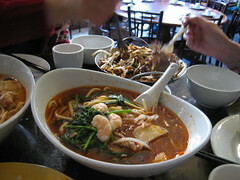 The two favorites (among my friends) were the prawn mee and char koay teow. And the bill including tips was $44. $11 each was pretty good since we get to sample all the famous Penang/Malaysian hawker food. I’ll post pictures of the food later.